|July 2007: A few additions to the BMW! Preparing for the Summer 2007 Trip I did a few additions to the BMW! Some were much needed; others were just for the fun of it! Two weeks before the trip, all the family went to London for 5 days. 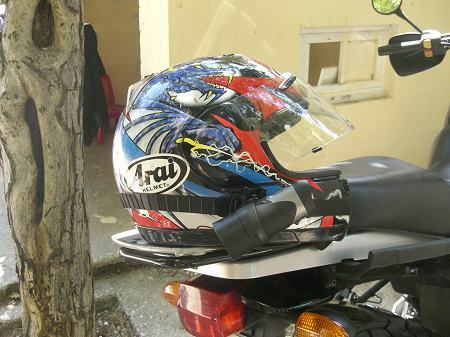 Since there is nothing really available there anymore that anyone cannot find in Greece, as well, I figured I would buy the "only" thing that was not yet being sold at Greek shops: An Oregon Scientific ATC2K helmet camera! Right after returning from England, my friends told me that the camera became available through an online shop in Greece as well! Oh well...! 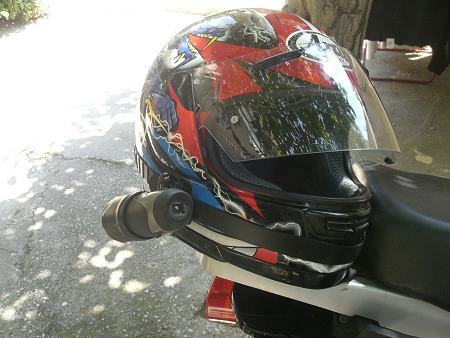 An elastic band wraps tightly around the helmet. Right behind the camera base there is a strong self sticking velcro pad. 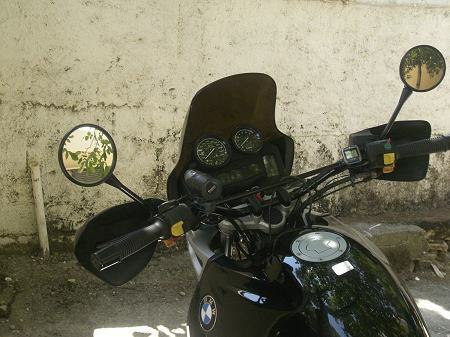 The angle of the camera is quite correct for riding the BMW. I did a few trial runs up and down the road outside my home, so as to find the approximate angle. 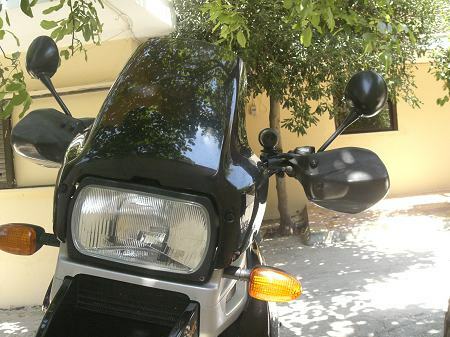 Eventually, I mounted it on the handlebar of the GS, using the supplied bar mount. 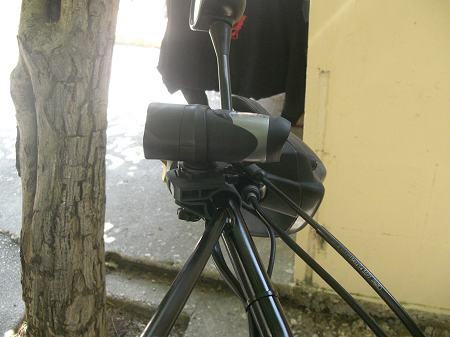 I tested it this way, too and it produced a much stabler video. 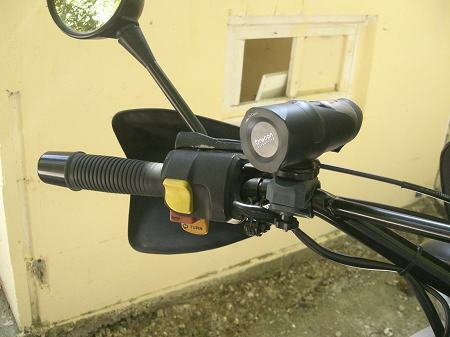 However, mounting and unmounting the camera from the bar clamp proved to mess with the "choke" cable on the left side of the handlebar. 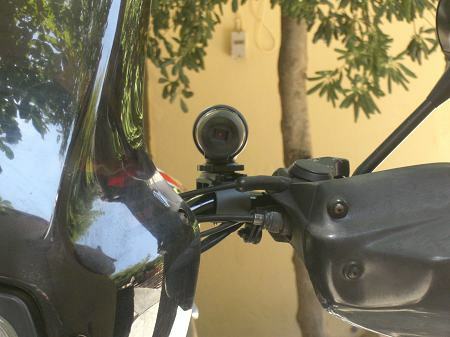 So, I removed the electronic speedo from the right side, and mounted the camera in its place, where it was clear of all cables etc. 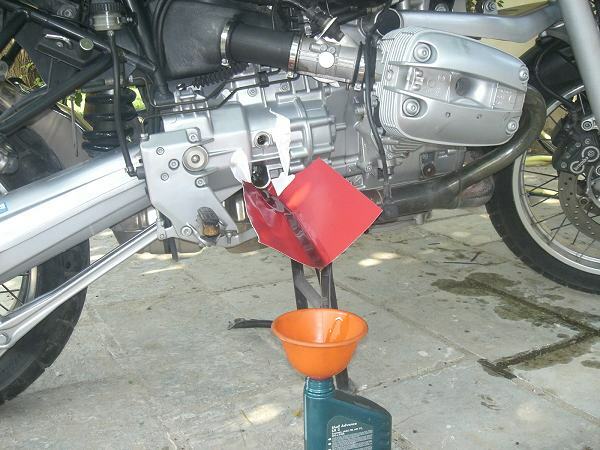 I remounted the speedo at the left. 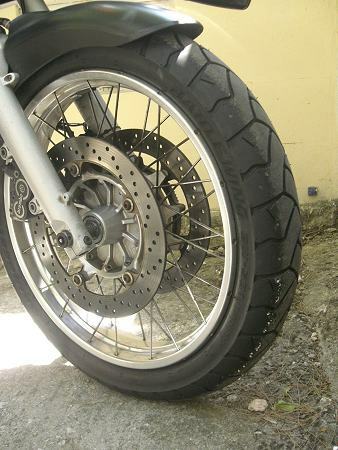 Bridgestone Battlewing tires. 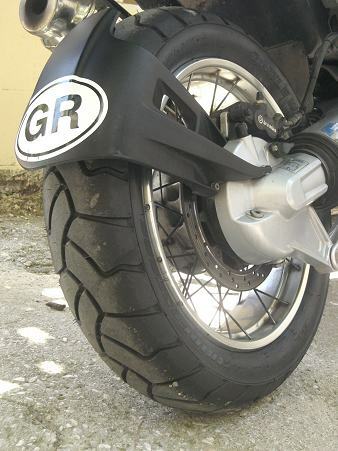 Initially they were finding amazing grip on the glazed roads of Athens, compared of course with the Metzeler Enduro 4 tires I had on the bike since 2004... 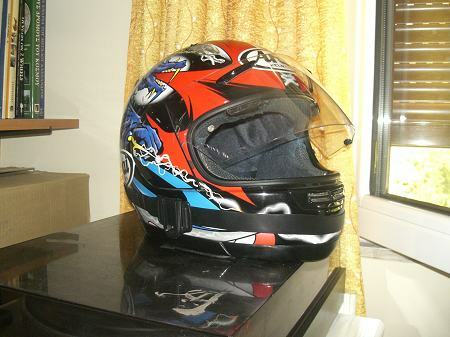 This lasted for the first 100-120km's. 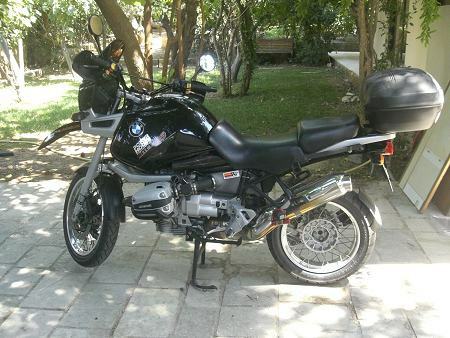 Then I loaded the bike and headed for the Summer 2007 Trip, which meant another 2700km's on them. After returning, the tires started slip-sliding around, as ever did all the tires! And I was worried these tires were... stickier! 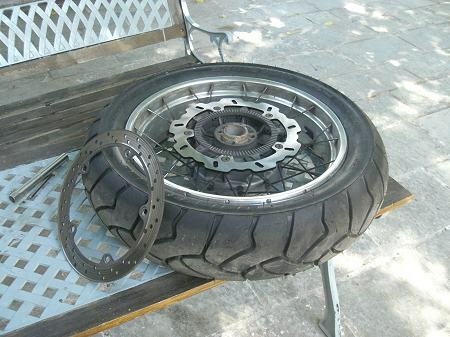 A Braking "wave" rear disc and new Brembo pads. 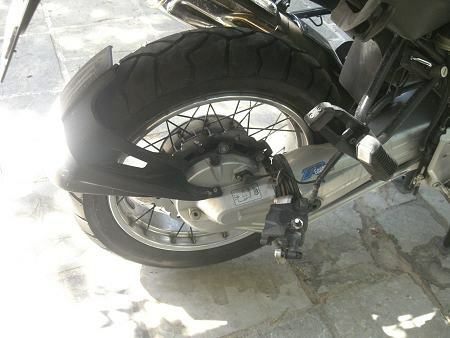 Having asked BMW what the cost of the original rear disc would be, I was a bit disappointed: 227 euros for the disc, plus 65 euros for the pads (Brembo or Textar, depending on what was available at the time). 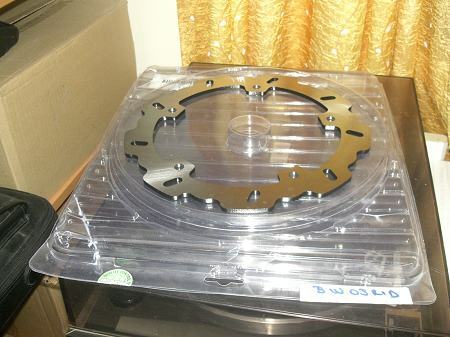 Instead, I shopped around a bit and found this Braking disc at 125 euros plus 30 euros for the Brembo pads. 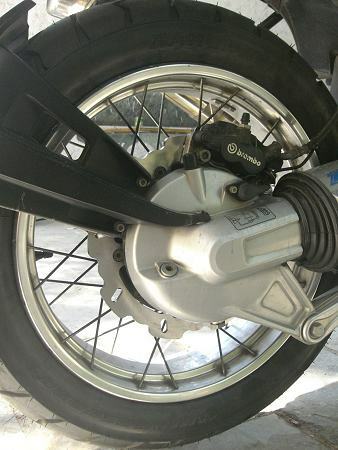 I did the installation myself in 20 minutes: Remove the rear brake caliper, unbolt 4 studs to take the wheel off the bike, unbolt another 5 bolts to remove the disc. Reverse the work and you're done. I also did a valve adjustment, an oil and oil filter change, gearbox oil change (photo above), rear drive oil change, new plugs and cleaned the KN air filter. In fact a complete service at my back yard!